Dr. Feryal Alidadi has advanced training in artificial teeth and possesses over two decades of experience creating natural-looking dentures that are custom fitted to her patients. She’ll perform your treatment so you get great results, making sure your dentures fit precisely and are comfortable, too. It’s very important that dentures look natural and beautiful. It is also very important that they work well when you chew. So at the top of Dr. Alidadi’s list is ensuring you have a proper bite. She will make your dentures natural-looking and will ensure they fit precisely, to give you the healthiest bite possible. Your new dentures will enable you to eat, speak and smile with confidence. Most denture problems are caused by a bad fit. Creating a perfect fit is a blend of art and science. Dr. Alidadi is experienced in planning and placing well-fitting dentures that look lifelike. 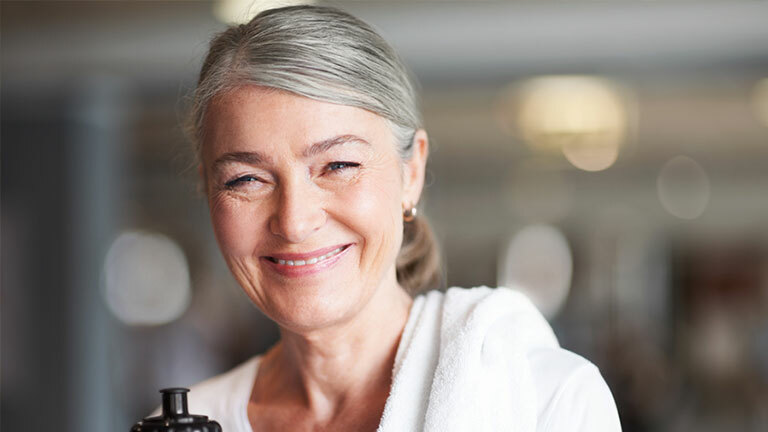 She’ll perform a comprehensive oral exam and discuss the various denture options that can meet your goals. Dr. Alidadi will make sure your dentures fit precisely and comfortably. She provides custom shading, fitting, shaping and alignment for a totally natural look. And with her no-metal dentures, no one will even know you are wearing dentures. To help prevent slippage, soreness, pain and chewing problems Dr. Alidadi can also use other denture solutions such as denture stabilization. Instead of partials with metal clasps, Dr. Alidadi uses Valplast® no-metal partials that are made with very strong plastic clasps. Her no-metal partials are perfect for many denture wearers. People who clench or grind their teeth or who have a heavier bite may not be candidates for Valplast. These can be full or partial dentures, and are secured to the roots of your own teeth, or to dental implants. This provides greater stabilization during chewing. Maybe you already have dentures and don’t want a full set of implants. Dr. Alidadi offers aesthetic dentures that look just like natural teeth. By placing a couple of implants with snaps on the lower and upper arches of the mouth, your dentures can be stabilized. This improves your ability to speak and chew, while preventing denture slippage. Implants can be used to support a dental bridge. For patients who are missing teeth, dental implants may be a good solution. A dental implant can be used to replace a single missing tooth or multiple teeth. Implants can also be used to support dental bridges and dentures, in the case of replacing several missing teeth. Dr. Alidadi uses an excellent local lab that provides top-quality work and quick turnaround, so your dentures can be ready with very little wait time. If you are currently wearing dentures and would like more comfortable ones, if you’d like denture stabilization with dental implants, or if you think you might need dentures, your first step is to come in for a consultation. Dr. Alidadi will explain your options and answer all of your questions.